I’m delighted to announce the release of a new blanket pattern – Iona! This blanket was inspired by the richly decorated carpet pages of illuminated manuscripts; it’s assembled from individual squares, worked separately in the round from the centre out, and then attached with a three-needle cast-off or seamed together. The contrasting colourwork effect is achieved by striping yarns of two different colours, and slipping the cabled stitches on every other round. Whilst the cable pattern that forms the Celtic knot was certainly a challenge to design, I think it was actually more difficult to decide on the colours to use in the blanket! The pattern uses Malabrigo Sock, which comes in a gorgeous array of variegated and semi-solid shades. I love how the subtle changes in colour evoke a faded wash of ink – perfect for a design inspired by illuminated manuscripts. Lots of different colour squares! Think these are, clockwise from top: Lotus (cable) with Aguas (background); Lotus (cable) with Impressionist Sky (background); Lotus and Aguas again; and Impressionist Sky (cable) with Aguas (background). After a lot of swatching, sketching and playing around with coloured pencils, I finally settled on a colour scheme that uses 5 colours for 4 differently arranged squares: Turner (green); Ochre (golden-yellow); Archangel (pink-purple-orange); Aguas (blue-green) and Rayon Vert (purple-green). Once I’d decided on the colours, it was a lot of fun to work on the individual squares and watch the blanket slowly growing. I particularly love how the shade ‘Ochre’ really pops in contrast to the other colours – I used this shade for the i-cord edging that completes the blanket. Iona is the first pattern in Illuminated Knits – a mini-collection of designs inspired by the rich colours and decorations of Celtic illuminated manuscripts and using beautiful shades of Malabrigo yarn. The collection will feature three accessory patterns (including the Iona blanket) and one garment pattern. It’s available to pre-order now as an e-book for £8.50 and you will receive the patterns as they are released over the coming months. If you’d prefer to wait until all the patterns are released before buying the e-book, you can sign up to my newsletter to be notified when the collection is complete! Uncia is an unusually shaped shawl, based on a 1/12th arc shape and inspired by Gothic and Romanesque cathedral architecture. I developed the cable and lace patterns based on cathedrals I visited last summer whilst travelling around France and Germany (in particular: Koln, Mont Saint-Michel and Carcassonne). It was a very fun challenge to try to capture the essence of these buildings in knitted stitches, and it’s probably something I’ll come back to in the future. Read more about my inspiration for this design on Jen A-C’s blog! … and you can check out the rest of the designs in the book as they’re being gradually released here on Ravelry! It was a real honour to be asked to contribute to this book, and to be featured amongst such a wonderfully varied and illustrious group of designers. Thanks to Kate and Jen, and all the team involved in bringing this book to life! We’ll be having a book launch at Kathy’s Knits, Edinburgh, on Saturday June 11th (which coincides with the Indie Burgh Yarn Crawl!). Kate, Jen and myself will be there, along with some of the hap samples, and we’ll be signing copies of the book, so if you’re in/near Edinburgh, please do come along! UPDATE (24th May): Thanks to everyone who applied! The deadline has now passed, so I’m closing the application process and will be sending out invites to the group over the coming week. I’ve been spending some time thinking about the process I go through when testing and editing my patterns. Due to the complex nature of my designs, I find I get the best results when using a combination of tech-editors and test-knitters from around the world (as I use some non-standard abbreviations and terminology, it’s very helpful to get a feel for what may be confusing to someone who does not have English as a first language). I’ve previously used some of the free test-knitting groups on Ravelry (and am immensely grateful to all the test-knitters there who have lent their time and skill to help improve my patterns – you know who you are! ); however, I’ve increasingly felt that my test-knitters should be properly reimbursed for their time, and so I’ve decided to set up a private group where I can post paid opportunities for test-knitting. I should point out that I don’t release patterns particularly regularly, so there won’t be a high volume of designs available to test, but if you feel like you’d be interested in working alongside me as I’m developing new patterns, then read on! I want to keep the testing group reasonably small, so I will probably not be able to accept everyone who applies (if you don’t hear back from me soon after the deadline, it’s safe to assume your application was unsuccessful – sorry!). If you’re accepted, you’ll be added to the group and get e-mail updates whenever I post a new test. (Note – it’s a Google group, so I think you may need a Google account in order to join. If you don’t have one, you’ll likely be prompted to create one when you get the invitation to the group). If you’ve test-knitted for me before, please mention it on the application form! If you’ve never test-knitted before and are curious about what it entails: I’m looking for eagle-eyed knitters who can spot the kinks in a pattern, comment on anything that seems confusing, give suggestions about what might work better, etc. (You knit up the pattern with your own yarn and keep the finished product: all I need back from you is your feedback on the pattern). Click here to apply! (Deadline is Tues 24th May). After getting a few requests for the written instructions to my free pattern Nennir (originally published in the Winter 2012 issue of Knitty), I’ve decided to post the file here so that it’s available to all! Please note that this is a fairly basic text file, generated straight from my charting program, and as such does not include any explanation of the abbreviations, etc. – you need to refer to the page on Knitty for all the info on how to knit the cowl. This is simply a text version of the charts ‘Cable Pattern Part 1’ and ‘Cable Pattern Part 2’ (you will need to work out the edging chart yourself as it isn’t included in the text file!). I will also be closing my web-shop for this period, so you won’t be able to buy the print version of Celtic Cable Shawls directly from me during this time (although you can still buy it via Ravelry, Amazon.com, Amazon.co.uk, etc. or by ordering directly from any major bookstore such as Barnes & Noble, Waterstones, etc.). Also, a big thank-you to Kate Davies for mentioning my book on her blog, as part of series of posts about designing and self-publishing! EYF and…. Celtic Cable Shawls book launch! With me, it seems like exciting announcements are a bit like buses…. you wait ages and nothing shows, and then two turn up at once! It’s FINALLY HERE! (and I know it’s taken so long… and I have to thank all of you for your patience in waiting for me to get this project to completion). 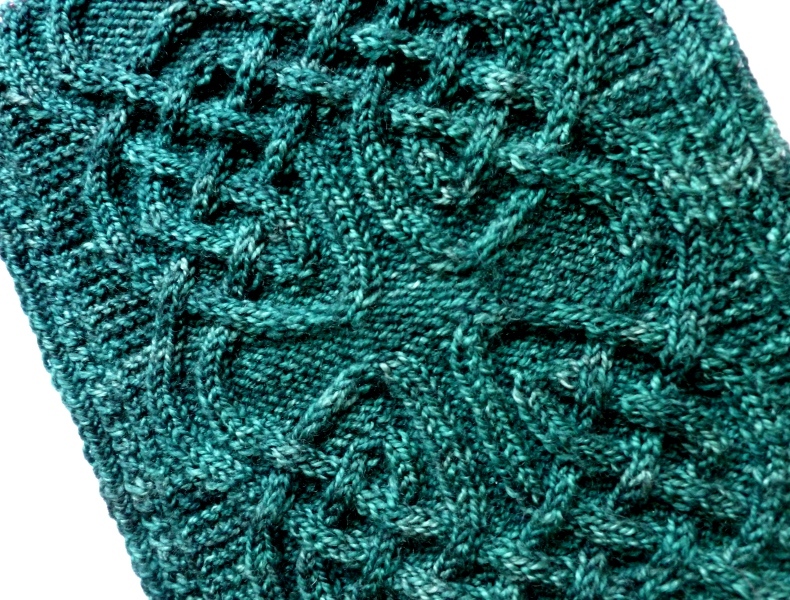 Celtic Cable Shawls now exists in print form (if you follow me on Facebook or Twitter, you probably saw the recent photos of me getting ridiculously excited after receiving the first print proof!). I will be having the official launch at Kathy’s Knits on Broughton Street tomorrow (Fri 13th) from 5pm to 7pm. It’s open to all, so please do come along if you’re in the area! I will also be selling copies at Edinburgh Yarn Festival (this weekend, 14th to 15th March) – I’ll be in stall A3, and I’m very, very excited to be a part of EYF! If you would like to order online, and buy directly from me, you can do so here! I’m opening it for pre-orders now and will start processing the orders on Monday 16th March (after I’ve recovered from EYF!). Please note all the orders via my site will take at least 5 business days to process and ship (each book is printed-on-demand, so it’s a bit of a slow process). If you want the book more quickly, you might have more luck ordering from your local Amazon (the listings are being updated gradually, so if you don’t see it as available right now, try checking back in a few days). If you order it directly from me, you’ll receive an e-mail with a link for downloading the e-book version too (note that if you buy the book anywhere else, you won’t get the free e-book version unfortunately. I would love to be able to provide it everywhere but it’s a bit of a logistical nightmare!). Some photos of the first print run! Important announcement for EU customers! UPDATE (5th Jan 2015): Celtic Cable Shawls is now available for EU customers to buy from LoveKnitting here – all of my individual patterns are available to EU customers via the integrated Ravelry/LoveKnitting checkout. There is one drawback, which is that LoveKnitting does not currently support Ravelry-based promotions. I have an on-going promotion where anyone who has bought the pattern Taliesin can get Celtic Cable Shawls with the price of the pattern deducted – this currently won’t work for EU customers unfortunately. If you’d like to take advantage of this offer and you’re based in the EU, please e-mail me/Rav PM me with your Rav username and Paypal e-mail address, and I can arrange a way to send the e-book to you at the discounted price! This is an announcement for anyone in the EU (not the UK) who wants to buy my patterns in the future (if you’re in the UK, or outside of the EU, this doesn’t apply to you so you can cheerfully ignore it!). From 1st January 2015, EU VAT laws are changing – sellers of digital products to customers in the EU now have to charge tax based on the customer’s location. Without wanting to get too ranty, this legislation has been very poorly written and badly communicated to the businesses that it affects – it took a lot of us by surprise and for the past couple of months, Ravelry has been working to find a solution. They have teamed up with LoveKnitting to provide a checkout service that will automatically add the required VAT to Ravelry pattern prices for EU customers. Not every designer on Ravelry will be using this service (for a variety of reasons), but after a lot of thought I’ve decided it’s the best solution for me for now (hopefully this will be a temporary solution and I’ll let you know once things change!). What this means for you, as a customer living in the EU (non-UK), is that from Jan 1st, when you buy one of my patterns on Ravelry, you will check-out through LoveKnitting. This process is entirely automatic, but you will be required to make an account with LoveKnitting (you only need to do this once). The pattern will still be saved in your Ravelry library as normal, the only difference is the check-out process. One small flaw in the system is that at the moment, it can’t handle e-books, so for a short while Celtic Cable Shawls will be unavailable to EU customers. There is a workaround which involves putting all the individual pattern files into one PDF and uploading to LoveKnitting – I will be working on this tomorrow and hope to have it available very soon. Apologies to all of my EU customers for the shortness of notice in communicating this change to you – and best wishes for 2015!